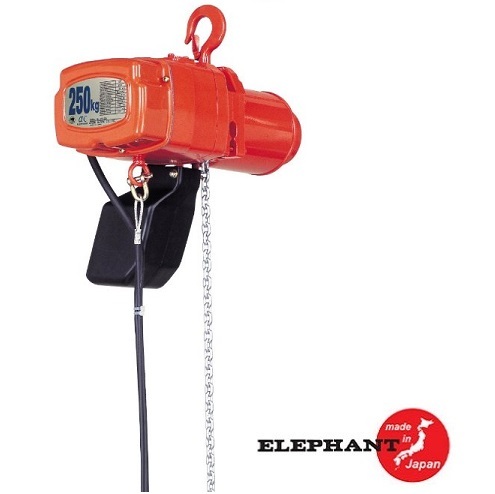 The Elephant Lifting Alpha S Series hoist is a single-speed electric chain hoist with a hook mount and a single-phase 0.8-horsepower motor with a 115V/60Hz power input. It has a fully enclosed aluminum die cast body. Overload and overwind safety device. This device ensures stability when the hoist is over wound, or over lowered. The device also protects against an overload of the unit, helping to prevent damage to the hoist and injury to personnel. Upper and lower hooks with safety latches are designed to slowly stretch in the event of an overload, allowing for a visual indicator to the operator, to cease operation. The bottom hook has a thrust bearing to reduce stress on the lower block, while under load. The pendant control’s contactor is designed for frequent use, guaranteeing excellent durability, even when ‘inching’ a load.